120 Days Same as Cash $916.50- Order Now Enjoy Soon. 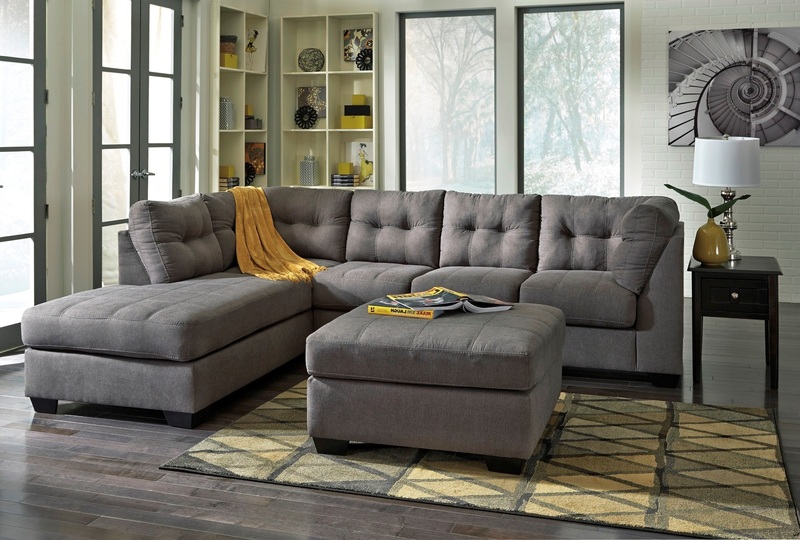 The comfortable contemporary design of the maier charcoal laf sectional features plush boxed seating and back cushions giving you the comfort you desire while helping enhance your home decor with exciting jumbo stitch detailing and tufted accents that embrace the modern style. Overall: 117" x 88" x 38"H - 207lbs. Laf Corner Chaise: 35.5"W x 87"D x 38"H - 106lbs. Raf Sofa: 79"W x 35.5"D x 38"H - 101lbs. Laf Full Sofa Sleeper: 80"W x 36"D x 38"H - 175lbs. Rocker Recliner: 37"W x 42"D x 41"H - 99lbs. Top of Cushion to Top of Back: 21"
Accent Chair: 32"W x 37"D x 38.5"H - 65lbs. Oversized Accent Ottoman: 36.5"W x 36.5"D x 21.5"H - 41lbs. top of Cushion to top of Back: 16.5"